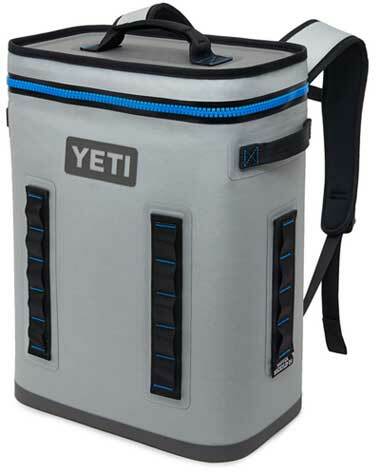 YETI Hopper backpack coolers have 3 key features that make them stand head and shoulders above most other soft-sided coolers. First of all, these packs have a Dryhide Shell. This external high-density material is waterproof and resists mildew. It holds up well for longer backcountry excursions because the shell doesn’t puncture easily and the backpack withstands UV rays. Note: The BackFlip fabric color may fade over time. However, this does not affect the durability or performance of the backpack cooler. Second, YETI uses closed cell rubber foam to insulate the cooler. In addition to providing superior insulation to the backpack cooler, this material also resists mold, mildew and bacteria. Tip: To keep cooler contents cooler for longer, chill the cooler itself and the drinks/food before your load them in. Also, minimize the air space within the pack by filling with ice. Lastly, block ice works better than cubed. 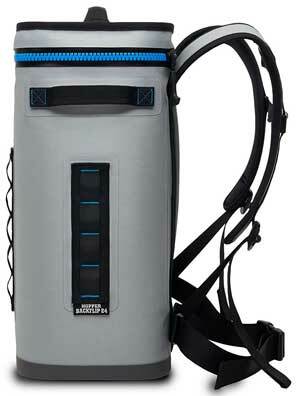 Third, the YETI Hopper Backflip features a “Hydrolok Zipper”. This super-tough zipper won’t leak, thus enhancing the insulation factor. Not no mention, keeping you and everything else around it dry. YETI coolers are known for their heavy-duty, ultra-durable design, but how comfortable are they to carry? The tall, wide design helps weight distribute evenly within the pack. If you’ve ever experienced a sore back from carrying stuff, you’ll appreciate this well-thought-out design. Extra wide shoulder straps have a comfortable, ergonomic design. Plus, they have padding. 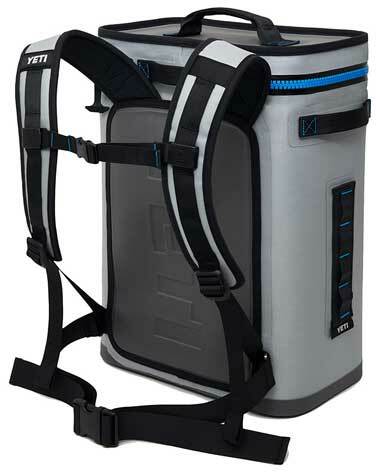 Unlike most backpack coolers, the YETI has both a chest strap and waist belt for a more secure fit. If you are hiking around the wood, you don’t need moving luggage on your back, right? Note: By the way, you can carry this backpack as a bag. Simply use the additional lid or side handles. And, don’t forget the exterior molle straps for attaching more gear, especially a bottle opener! Rinse your pack with water (and dish soap if necessary). Then, wipe it dry. Don’t stick it in the washing machine. Make sure the interior and exterior is dry before storing it. Also, when you’re not using it, keep it zipped shut to protect the zipper and closure. If you need more information, you can check out the user’s manual.